Home » Blog » I guess it all boils down to protein! 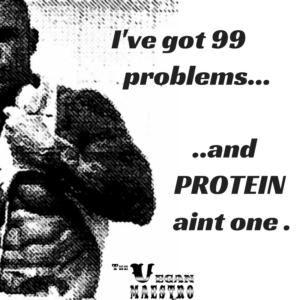 If you are deliberating whether eating a plant-based diet will restrict your fitness and wellbeing gains; and/or are generally concerned about getting sufficient protein from a vegan diet, then think of it like this…. The basis of getting fitter and building muscles is that we put our body under targeted stress, causing damage at the micro level, which the body repairs and then adapts so that further exposure to that stress will no longer cause harm. Progressive overload. Basic survival programming.True? We know getting the energy won’t be an issue so all we need to be sure of is that our body will have the resources to effectively and efficiently repair the damage our workout has caused our body. So it all boils down to protein. Most gym goers I know aim to get in at least 200g a day: this figure seems standard advice in fitness / supplement industry. That’s 73kg a year. Bear in mind the most ardent bodybuilder is doing amazingly well gaining 10kg of lean muscle a year. Is our body really that inefficient? Or are we being misled by the very people that are trying to sell us protein?? The average [non gym rat] person needs only to consume 40g- 50g of protein a day. The average Olympian athlete only consumes 80g of protein a day. Do you really think you need 200g a day??? A world record strongman (Patrik Baboumian ) and My Olympian bodybuilder (Barney Du Passis) compete on a plant-based diet. As do tennis aces, the Williams sisters. And numerous other athletes across the Earth. Do you want second-hand protein? Only plants create protein by a process called photosynthesis. When we eat animals we are getting second-hand protein. Which do you think then is of a better quality, the protein sourced straight from the manufacturer or the pre-owned ??? Beans, peas, seeds and nuts are rich in top quality protein. Plants are also high in protein as 14% of their calories come from protein. They are nutritionally dense while calorie poor. Just the way we want it really! Even if you really wanted to consume 200g of protein a day, with these foods, it is still possible. There are plenty of plant-based protein powders on the market that offer refined protein from peas, hemp and other plants. Do you think this would be of a better quality than ‘whey protein’ which is a byproduct of the manufacture of cheese and is found in the left over liquid after milk has been curdled and strained? So as long as you follow a consistent exercise regime, workout with the required intensity, get plenty of rest and eat a balanced plant based diet there is absolutely no reason why your body can’t reach its optimal potential. Our best interests – or profit? Now you can go and read hundreds, if not thousands of articles suggesting that you need 200g of protein a day. That you can’t go vegan and build muscle. That plant protein is of an inferior quality. Yada yada yada. Thinking about it logically as laid out above. What do you think is the truth? Are these supplement and livestock companies that sell protein and are in partnership with the fitness media telling us the truth? Do they really have our best health interests at heart? Or they more interested in making profits? What does your gut tell you? 50% of the anti-biotics made by Big Pharma are sold into the meat and dairy industry. That raising animals for food is the second leading cause of air pollution above traffic. That there is no humane way of killing something that wants to live. That animals are being murdered, raped and tortured by the billions each year. Maybe its time to start listening to our own bodies and minds rather than blindly following the advice of business owners. I don’t believe that a plant based-diet is the best diet to follow. I know it. Read about my journey into veganism here. James Poet is the The Vegan Maestro. 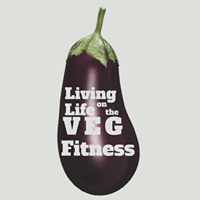 He is the owner of Living Life on the Veg Fitness, helping individuals transition into veganism and improve levels of fitness by providing personal training and dietary advice, with 24/7 support.